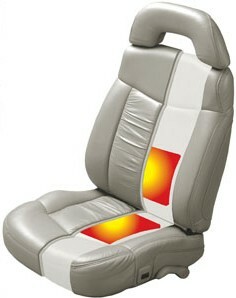 Mr. Kustom is the leading facility that custom fits Heated Seats in almost any vehicle. Our Heated Seats kits are of the highest quality and meet and exceed original equipment specifications. The comfort and pleasure of heated seats is now available in three product levels for most vehicles, and can installed by Mr. Kustom. Seat heaters from Mr. Kustom quickly provide comforting warmth to the body through the seat’s cushion and back long before the vehicle’s heater has a chance to heat the interior. Contact us today to have Heated Seats installed in your vehicle. This entry was posted in Blog and tagged Auto Heated Seats, automotive industry, car accessories, Car Heated Seat, car owners, Heated Seats, Truck Accessories, Truck Heated Seats.